Augmented reality is back in discussion, and again with the same hype that was associated to it a few years back (starting from 2009- next bout in 2012 and now in 2016). And why? 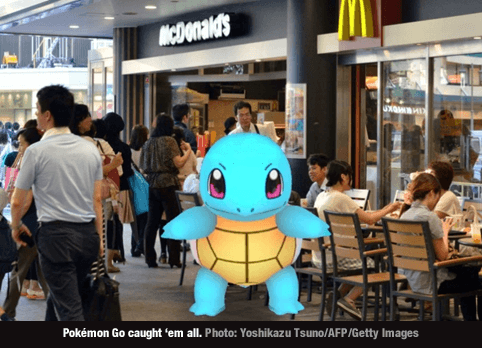 All thanks to the latest game by Niantic- Pokémon Go, that urges you to ‘Get Up and Go’- go to the outside world, holding your handheld device and collect all the virtual creatures superimposed on some major landmarks (or maybe not) around your locality. An interesting way to walk around isn’t it. What else would motivate the lazy, introvert, couch hugging populace of today (being sarcastic here)? There are other games/gamified apps that have managed to do so earlier too. Zombies, Run! for instance, did manage to make gamers run physically for their lives (oops virtual lives! ), though it just used the basic functionalities of the device for tracking the motion changes which was then calculated as the distance covered by the virtual avatar as it runs away from the Zombies, collects supplies etc. Major difference from Pokémon Go- no augmented reality here. However, developed by Niantic-Ingress, an augmented-reality massively multiplayer online location-based game, had similar aspects of game play where locations within the game were based on actual locations where players travelled to, to find portals, to form teams, to hold battles and in turn move ahead in the game (Can’t call Pokémon Go a copy though). Interestingly there is an actual outdoor recreational game that uses the power of GPS called Geocaching. This game has been around since the 2000s. Players/geocachers as they are called place a waterproof container containing a log book (with pen or pencil) and trade items or trackables, then record the location’s (cache’s) coordinates. These coordinates, along with other details of the location, are posted on listing sites. Other geocachers obtain the coordinates from that listing site and search for the cache using GPS on their handheld receivers. Interesting concept for travel enthusiasts isn’t it (imagine what the travel industry could do with this)? Yes, the game is interesting, a novelty for many as their device suddenly turns into this Pokémon collecting machine. eLearning ought to be fun too and not a forced task. What we should learn here is content presentation- representation- a concrete story to set the background, the social and interactive elements etc. are the critical aspects of creating a game-like environment. What makes it even more interesting is that it is accessible to almost everyone who owns a smartphone, and hence the emphasis on mobile devices for eLearning. 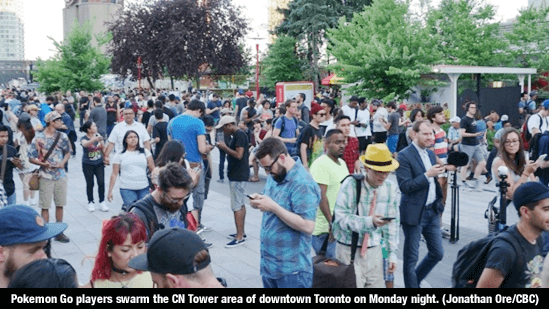 Pokémon Go players are constantly awarded Poké Balls, candies and stardust, experience points for various in-game activities- and this keeps them going. The use of AR has been widely discussed about, used in training too and currently with the availability of new tools like Hololens etc. provides more scope depending on how well it is used. However, innovation doesn’t always have to be AR; it could be just a novel concept that meets the purpose. Maybe something like having Poké stops (not in the literal sense) within the office to increase team communication, interaction etc. or giving the sales team members avatar and leader boards to create a competitive environment within the team supported by awards/badges given to individuals on completion of certain tasks. What drives average Pokémon Go players towards the game is the aim to ‘catch ‘em all’- the original 151 Pokémon, completing the Pokédex (a comprehensive Pokémon encyclopedia) and becoming a Pokémon master. When gamifying eLearning, the ultimate goal is often the driving force. Many a times the teaching/training aspect overpowers the whole purpose of the game designed by addition of too much information. The key lies in striking the right balance. Say for instance, if training includes certain technologies or process knowledge the ultimate goal would be becoming the Guru/Wizard. Each level would have a title associated along with points for the activities done. Leveling up as it is known builds curiosity and in turn motivates the learners. Pokémon Go, has managed to impact the entire world. As eLearning developers we all wish to have at least an organisation wide impact. So, think of all the factors that make Pokémon Go the game that it is choose the ones that we can incorporate into the learning designs and make the best out of it. What are your thoughts on Pokémon Go and its elements in eLearning? 'Jack of All Trades', is the best way to describe her. In a span of 6 years Linu has worked in diverse fields including KPO, Data Analytics, Medical Laboratory Technology, Clinical Trials, and Instructional Design. With prime focus on Content Writing she is currently a part of Upside's Marketing Team. In her present role she is responsible for the conceptualisation, planning and execution of marketing campaigns, and utilises her creative streak in copy writing for marketing communications and digital marketing. Linu holds Master's degree in Microbiology from Sardar Patel University, Gujarat. She enjoys singing, is an avid blogger, a budding photographer, and utilises her free time at learning new craft-skills.